The finished part has numerous interior surfaces covering almost the entire area of the casting to be held flat and co-planar within .005” in a free state. (10) Jig-Bored 4MM holes with a diametrical tolerance of .0004”, held within a True-Positional tolerance of .003’ to a large central bore with a diametrical tolerance of less than .002. Several milled surfaces on the sides of the part held to within +/-.002 of the centerline datum and within .002 flatness. Two “V” cuts held to within +/-.002 over a gage cylinder in two dimensions. This item is a precision-machined housing that positions and holds the components that comprise the working “guts” of what is essentially a large-format digital color laser printer. A Laser Collimator beams the digitized document image into the housing, bouncing the light off several stationary mirrors and into a radial mirror with 16 facets rotating at 28,000 RPM. From there the image is refocused through several more mirrors, (including one that must be adjusted at assembly by physically bending it) and exits the housing into the printing area of the machine. Every component inside the housing must be accurately located for the image to be sharp and clear. For a project like this, the best way to assure accuracy is to perform the machining in as few steps as possible. 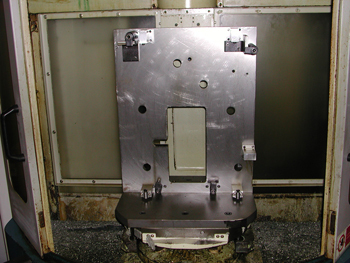 We chose our Daewoo DHM400 Horizontal Machining Center to perform the task because of its rigidity and accuracy. 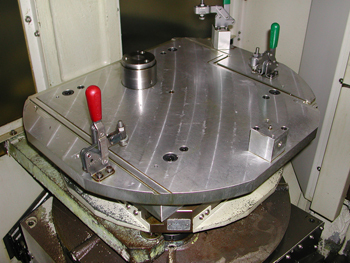 The 60-tool magazine held more than the required tooling, the rotary table allowed us access to four sides of the part and the workpiece fit the envelop of the machine. We designed and fabricated two fixtures for the job. The first fixture accurately locates and firmly clamps the casting, and has clearance for us to reach through and perform machining on the backside of the part. The second fixture allows us to lay the workpiece down to reach its end and machine two critical holes that locate the housing in the document center as well as drill and tap some holes for access covers that bolt on. In a single machining operation, we hit the part over 250 times on four sides in two clampings with a cycle time of just over one hour. 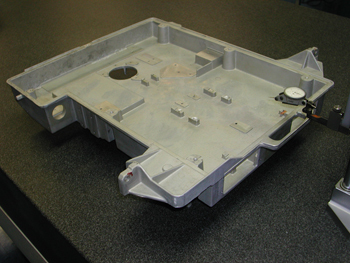 The part comes off the machine complete and ready for chem film and assembly with the exception of one five-minute drill press operation, providing an exceptional value for the customer and more than meeting their production schedule.